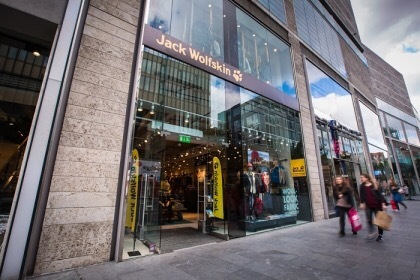 Jack Wolfskin, the German outdoor clothing and equipment brand, has opened a new store on Liverpool ONE’s Paradise Street. The 3,000 square foot space stocks the full range of Jack Wolfskin clothing and accessories for men, women and children. The opening of the store coincides with the launch of a new brand campaign by Jack Wolfskin using the new hashtag slogan #MakeYourLifeUnfortgettable. As well as being implemented across a range of media, including a new television commercial, the campaign is the inspiration for the design of the new Liverpool ONE store. Other brands planning to open stores on Paradise Street this year include Lindt, Smiggle and Urban Decay. Posted on October 7, 2016, in #retail, #uk, Other. Bookmark the permalink. Leave a comment.